There’s a painting on my refrigerator. You know the kind. Watercolor trees, some grass, and a few unidentifiable bright lines. My granddaughter Amelia gave it to me, and that’s what makes it precious. Just around the corner, a print by Van Gogh hangs in the living room. The Harvest. Have you seen it? 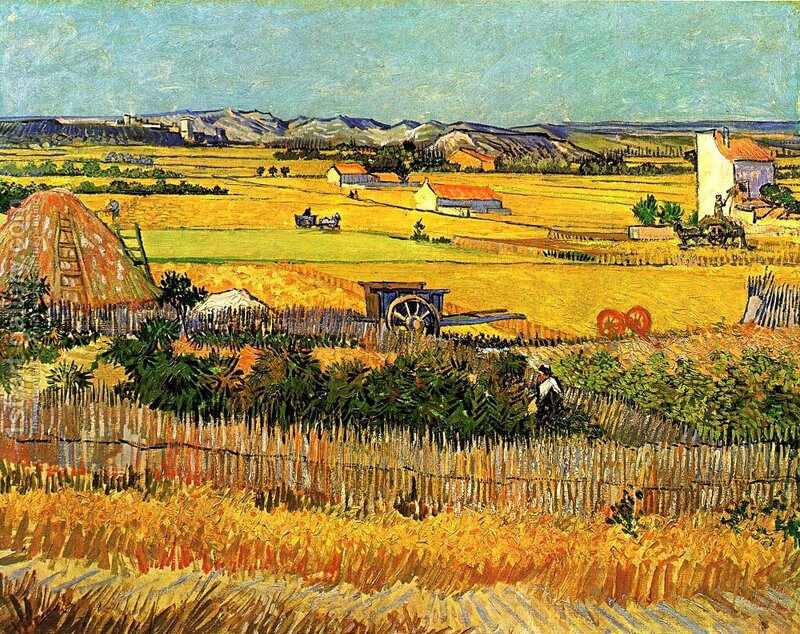 The rough strokes, texture, and bright, rich colors are Van Gogh’s trademarks. Today, one of my sons asked me who he looks like in the family. I told him he looks like his dad when he was younger. He held back a smile, but his eyes gave his pleasure away. The worth of a creation emanates from its creator. That’s why what might look like scribble to some hangs by a magnet in the household place of prominence, reminding me daily of the dear little soul I love. The value of a work of art is extrinsically connected to the skill of the artist. That’s why paintings by Van Gogh, who was virtually unknown before his death yet remembered as one of the most influential artists in history, are recognizable worldwide. The image of his father is reflected in the face of my son. Which is why the pride of being connected to one he holds in high esteem could barely be contained. Then God said, “Let Us make man in Our image, according to Our likeness;” . . . Your worth emanates from your Creator. Your value is extrinsically connected to the one who skillfully and intricately wove you together in your mother’s womb. And the imago dei (image of God) revealed in you connects you to our creator like no other created being. This is what defines you and declares who you are. Just as my granddaughter’s painting, the Van Gogh in the living room, and my son’s face reflect and are defined by their “creators,” so are we. That scribbly masterpiece on my fridge. Over on the side, just to the left of the tree, is a face. She’s smiling. And on the other side of the tree is a painstakingly scrawled name. Mina. That’s me. Here’s a practical application of this week’s focus. Do you define your worth by who created you? Do you determine your value by your skills and strengths or by the skill and might of the One who formed you? How does the imago dei in you influence how you see yourself? Read Psalm 139:13-16 aloud. Do you agree? Journal your thoughts. The Creator God created, formed, and called you by name. You are His! Write a prayer thanking Him for His love. Every week, I’m exploring what winsome living looks like. What does it mean to be embraced by love and sustained by joy? Click here to receive my weekly post in your inbox. Click here to read the first chapter of my book An Imperfect Woman. Click here to order An Imperfect Woman. Connect with me on social media at Instagram or Facebook.